As an Illinois Public Benefit Corporation, Mightybytes is required by state law to publish an annual report describing our benefit to society. Here’s what that meant to us in 2017. 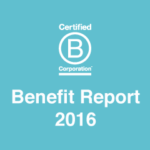 As a Certified B Corp since 2011, we measure what matters because it gives us a roadmap for building a better company. For Mightybytes, this means making an ongoing commitment to the triple bottom line of people, planet, and prosperity. The Benefit Report below shows how we executed that commitment in 2017.
we were included in B Lab’s Best for the World list. we achieved our highest score ever—102 points—on the B Impact Assessment. This report shows how our small company continuously strives to make a big difference. We hope you enjoy our story (download this 3.1 MB PDF file by clicking the button below). 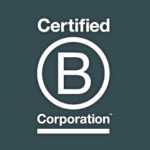 For more information on what being a Certified B Corp means to Mightybytes, check out our page, Proud to be a B Corp.